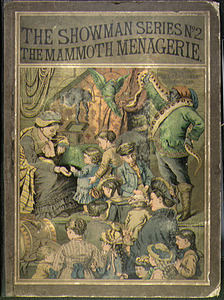 In the 1880s, McLoughlin Brothers, a New York-based publishing firm, introduced The Showman's Series, the first movable books produced in America. Published in small and larger formats, these works contain three-dimensional scenes. 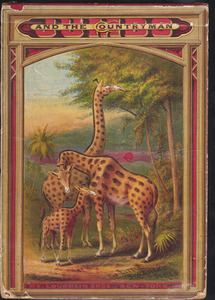 They feature zoos, aquariums, and circuses, the regular fare of late nineteenth-century family-oriented entertainment. Again, we see tableaux and pop-up books drawing on the standard themes of children's literature, a trend which runs well into the twentieth century. 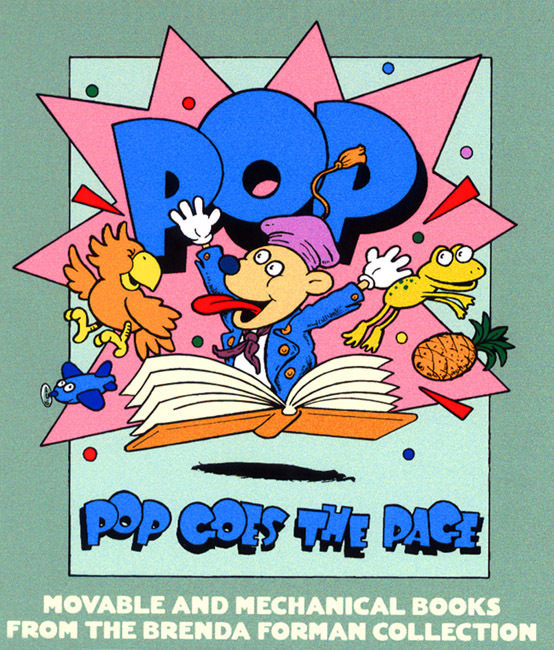 This conformity in content grew out of the already considerable risks involved in making pop-up books; no investor wanted to gamble with the public appeal when the costs of production were so high. Moderately educational and gently fanciful, The Showman's Series uses the conventions of the stage. The very placement of "showman" in the title stresses the theatricality. As the tableaux unfold, the operator becomes both audience and playwright, responsible for observing the illustrative details and plotting the action on stage around them. In an era before cinema defined modern spectatorship, these books demanded a different kind of creative interaction, combining aspects of passive viewing and active play. The Snake Charmer. Little Showman's Ser. New York: McLoughlin, . The works are consistent with the nineteenth-century taste for public spectacles that provided consumer pleasure and diversion. However, these tableaux also enforce the moral status quo. Every theme of the series defines and confirms the subtexts of conventions and the socially acceptable limits of behavior. 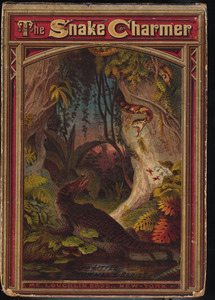 The books display a strong sense of "them" versus "us," being at once fascinated by the exotic--the snake charmer, the native warrior, foreign animals--while seeking to contain them within a familiar, westernized context. As one little boy cries upon seeing the snakes: "Have no fear! Papa, the show gives me delight." The books offer the nuclear family as a reassuring buffer zone. Jumbo and the Countryman. Little Showman's Ser. New York: McLoughlin, . Inside The Snake Charmer, we look over the shoulders of the Western family to observe this novelty sideshow, with the "uncommon sight" of a woman charming four snakes and an exhibited warrior. These onlookers and the text serve to guide our reactions, although a modern audience must wonder at the stereotypical and racist native imagery. Meanwhile the Jumbo scene shows the odd machismo of the gentleman who, having lost his hat, picks a fight with the elephant, armed only with his outrage and umbrella. Beauty and the Beast. New York: McLoughlin, 1893. The structure of this piece resembles early works referred to as "harlequinades." These books used the simple device of bound full pages cut into smaller sections which can be turned separately to manipulate the images and the narrative. In this example, McLoughlin reinforces the image of the theater by framing the story with spectator balconies and theater curtains. 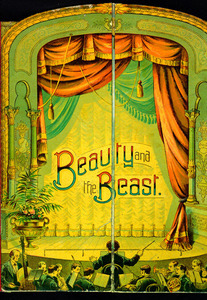 The tale unfolds, then, on a stage proscenium, a subtle way to embed the oriental world of Beauty and the Beast in a westernized context. The Mammoth Menagerie. Showman Ser. 2. [New York: McLoughlin, 1880s]. 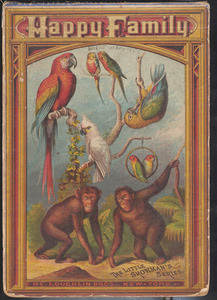 The opening page of this collection of single tableau works of The Showman's Series presents an advertising poster. Capitalizing on its connection with theater and shows, the book promises to be "Open Every Day of the Week or whenever anybody wishes to see it." It has a two dollar price of admission, "entitl[ing] the person not only to look through the beautiful menagerie, but to take it home with him." Apart from this poster, the book reproduces the imagery, designs, and engineering techniques of the earlier works. 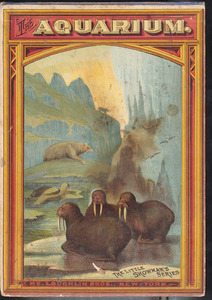 The book's sheer number of scenes justifies the "mammoth" rubric. Happy Family. Little Showman's Ser. New York: McLoughlin, . Happy Family and The Aquarium make good use of the format of the tableau as stage sets in which a child's imagination can wander, framed in these instances by the walls of either a cage or a tank. Strangely, there are no families, happy or otherwise, in Happy Family, just a dog at play in a monkey cage. The "roguish Apes" appear rather subdued, and the children must look to the canine for "...tricks that fill them with delight." The use of an early form of cellophane causes the glass wall of the aquarium to sparkle, and we stare with the children into this underwater world where "the sea-horse kicks about his heels." Above the tank, an illustration of an outdoor waterfall reminds us of the natural habitat of the fish, contrasting sharply with the indoor artificial container, decorated with "tinted shells and coral red." The Aquarium. Little Showman's Ser. New York: McLoughlin, .